The tennis team won all six matches on March 15 against Linden at Rio Del Oro. Senior Leonardo Eisner won 6-2, 6-2, and sophomore Keshav Anand won 6-2, 6-2 in boys singles. 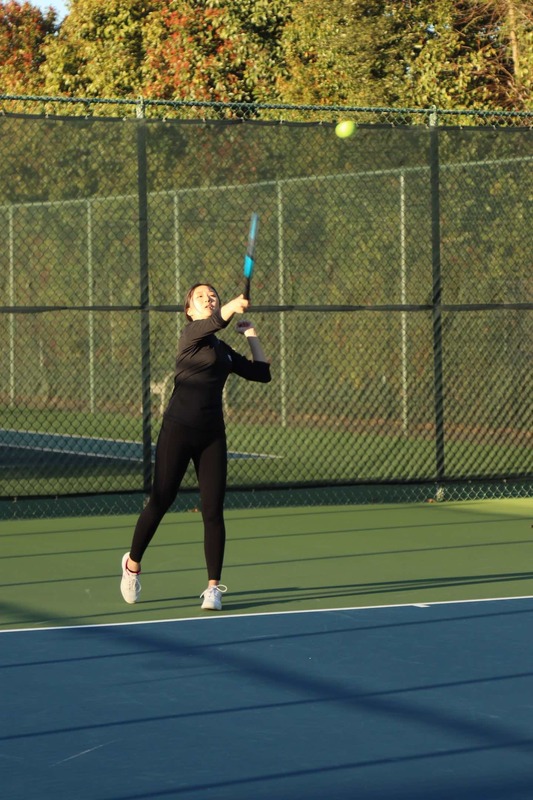 Freshman Sanjana Anand won 6-3, 6-1, and senior Michaela Chen triumphed 6-0, 6-1 in girls singles. Sophomore Shelly Zalezniak and senior Chardonnay Needler won 10-4 in girls doubles. Freshmen Tina Huang and Vanessa Escobar also played girls doubles, winning 10-3. Both Linden and Country Day had one default — boys doubles for Country Day and mixed doubles for Linden. Anand, Zalezniak, Escobar and Huang debuted for Country Day (2-0). With freshmen and new sophomore players, the team could make a run for the league title this year, according to coach Jamie Nelson. Escobar said it was “awesome” that everyone did so well and that she enjoyed playing doubles. Huang attributed the win to practicing before the match. “We had time to rally, and I think it really helped us to get warmed up,” she said. Escobar said the most challenging part of the match was serving. “Both Tina and I missed a couple of serves in a row, which made us keep trying harder and harder,” she said. Chen also said she would like to improve her serves and endurance. The team’s next match is scheduled for Tuesday, March 19, at Forest Lake at 4 p.m.